A Green Strategy Report (Turner, 1991) recommended a series of overlapping networks, each with its own qualities (Figure 5). The first network, for pedestrians, was proposed as a series of discrete projects, growing from destinations, including railway stations, shopping centres and schools, or following desire lines, or following lines of opportunity, including parks, river valleys and canals. The pedestrian network is being developed by a non-statutory group, known as the London Walking Forum. The walks are single-purpose recreational routes (Figure 17.6). The second network is for cyclists. This is being promoted by another non-statutory organization, the London Cycling Campaign. The 1000 mile Strategic Cycleway Network will link local centres in London, as a commuter network. Like the pedestrian network, this is a shortsighted policy. Both networks should include routes for commuting, and both should include routes for recreation. Commuter cyclists want short safe routes. Recreational cyclists want long beautiful routes. Occasionally, they will coincide. The third network is of bioological corridors. When wildlife corridors were first proposed, planners hoped, romantically, that they would become wildlife conduits, enabling the "concrete jungle' to be re‑colonized by native fauna and flora. Scientific research is not supporting this attractive hypothesis ( Dawson, 1994). Very few species have been shown to use corridors as their only or major means of dispersal. There are, however, other arguments for ecological corridors. First, they are a form of habitat that has an extensive zone of visual influence, because they have more "edge' than non‑linear habitats. Second, they can be spread throughout the city, creating opportunities for the full range of soil, water and climatic conditions to be reflected in habitat types. Third, they have a spiritual value. Too often one has the feeling that our civilization is obliterating the natural environment. 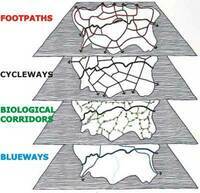 The network of ecological corridors is promoted by a third non-statutory body, the London Ecology Unit (Greater London Council, 1986). The fourth network is of river corridors: (1) existing rivers and streams (2) old rivers and streams, released from their underground conduits (3) new swales and drainage routes, formed as part of a Sustainable Urban Drainage System (SUDS). The maps below relate to the pedestrian network. They show (above) the existing long distance footpaths existing in 1991 and (below) proposed new routes to create a network of radial and circular walks.